Businesses have different policies with regards to an employee’s absences. Some may require proof for the reason of absence, especially when an employee calls in sick, and some simply do not require anything at all. 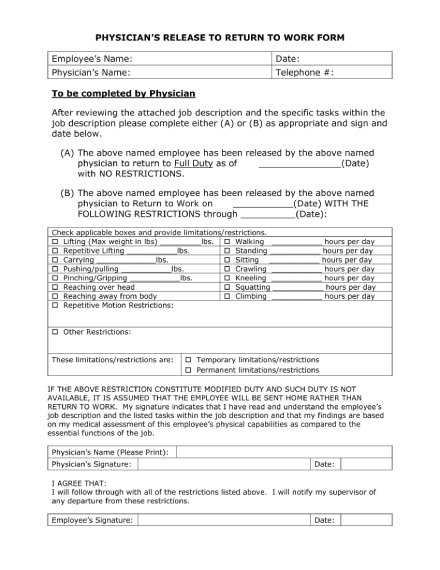 In this case, a doctor’s note can be used as a supporting document for your leave of absence, proof for a legitimate reason for missing work. It contains information regarding the illness or injury you were diagnosed with during your checkup. It also states the date/s you were confined or requested to rest as well as additional information that will relate to the reason for your absence. Companies have different policies when it comes to official business concerns like this but still adhering to the laws of their land. For example, in the UK it is not a requirement to provide proof of illness unless you have been gone for a week or more. In the US, it is legal for employers to ask questions about your condition or to demand a doctor’s note, but companies can’t demand information about your diagnosis and other private medical information. Knowing the company policies first ensures that you are able to follow the rules and provide what will be needed from you. 2. Schedule a doctor’s appointment. A doctor’s note or medical note can only be valid if a registered doctor signs it. Therefore, if you are feeling sick, it is best to schedule a doctor’s appointment immediately, that way you can have your condition diagnosed and have your absence certified. You can schedule an appointment by calling the doctor’s secretary for a face-to-face consultation. Although some doctors are willing to asses you through the phone especially when it’s just a minor illness like flu, food poisoning, or even the common cold. 3. Request for a doctor’s note. When you have a phone consultation, it is best to immediately ask the doctor that you will need a note to certify your reason for missing work and ask if it’s possible to have it faxed to you or directly to your office. On the other hand, for a face-to-face consultation, it will be easy for you to ask your doctor for the note. Just provide other details that he or she might need. 4. If under medical care, directly ask for the note. If you are directly under the medical care or confined to a hospital, you can directly ask for a doctor’s note. A doctor can easily issue the note confirming that you were a patient. The note he or she issues can then be submitted to your employer as proof for your absence. Remember, discharge summaries contain your private medical information; your employer is not entitled to get that information from you. 5. Fill out any document required by the company. When you come back to work after your absence, there might still be documents that you need to fill out, sign, and submit. You need to comply with additional company policies, especially if your absence is long. In the UK, you will be asked to fill out a self-certification form for a record if you have missed more than a week of work. On the other hand, in Canada, you will be asked for a formal medical certificate for extended sick leave within 15 days of your return. If you still need some special consideration like limitations to what you can do after your sick leave, you have to ask your doctor to fill out a reasonable accommodation form. This simple doctor’s note for work template is easy to use and edit. You can tailor it to your company’s standards or format, but you will still need the signature of your doctor. Your name as the patient, when you were diagnosed with the illness, number of days you were requested to rest as well as other relevant details are included in this template. An excuse note can also be used in the workplace to certify the legitimacy and necessity of your absence. This doctor’s excuse note will tell your employer when you had an appointment with the doctor and the date when you will return for work. It also lets the doctor write the limitations as to what you can do once you resume duty to help your employer understand your situation. A return-to-work doctor’s note specifies the date when you will be back at the office. The note helps ensure that your employer has knowledge of when you will be fit enough to work, similar to that of a fit note. If there are any limitations as to what you can physically do, this template will allow the doctor to list it all down. 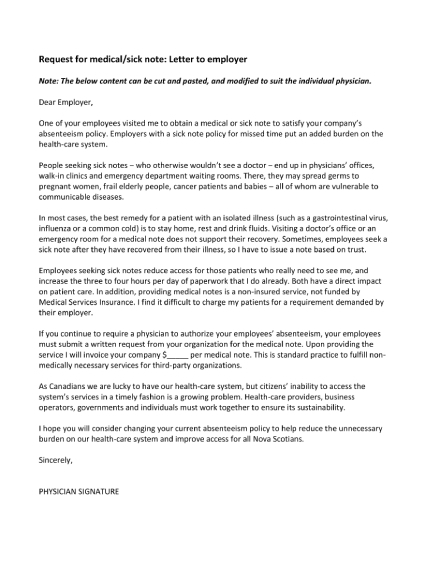 This doctor’s note for sick employee template states the necessity of submitting a written request from the employer. It clearly states that employers have to pay for the service of issuing a doctor’s note since it is a non-insured service. 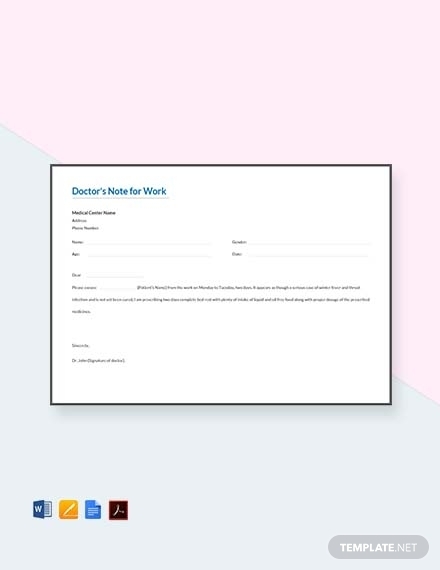 You can use this template if you are a doctor or physician aiming to lessen the unnecessary number of patients requesting for a note for missing work. 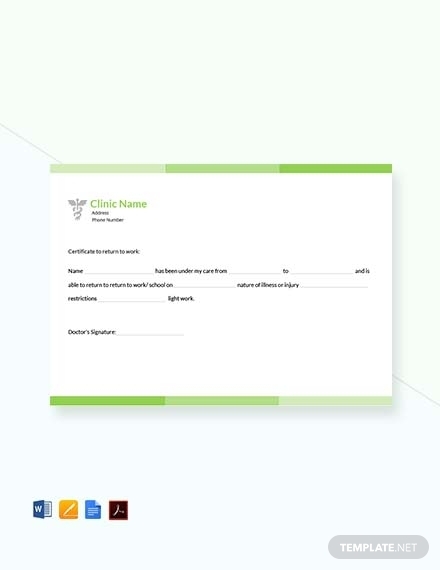 This template officially releases a patient from medical care to return to work. It offers choices for patients with or without limitations when returning for work. It uses checkboxes to help efficiently provide all the necessary information that the employer needs to know. 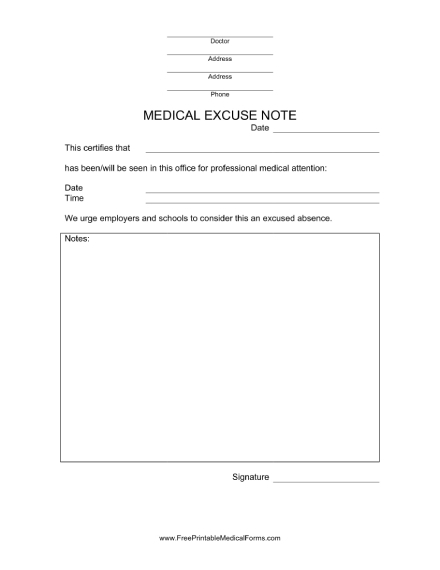 This doctor’s excuse note for missing work template can be easily filled out to contain the information you need to provide as the watching physician of a patient. It is straightforward and only needs the essential information that an employer will need. A special designated place where you can write notes about the patient’s case is also provided. All the templates provided in this article are free for use; they are easy to edit so that your preferences as the user can be catered to. We hope we have provided enough information to make the processing of acquiring a doctor’s note for missing work easier for you.